PS. Thank you for your interest and friendship this past year. I am now closed for a few days and will re-open again for business on January 2nd. 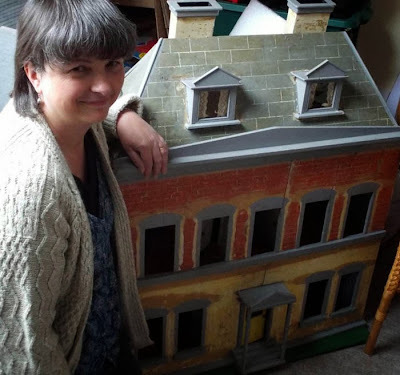 Further Restoration On The Lovely Swan House! If you read the previous post on here, you will have seen the wonderful discovery of a rather lovely house underneath layers of modern brick and roof paper. Needless to say this sold very quickly! I was itching to have a further little scrape on this beauty of a house and the buyer confidently gave me instructions to scrape away. 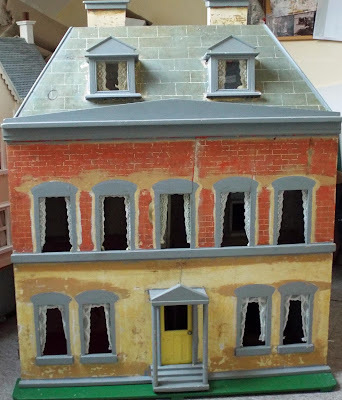 So, over the couple of days whilst this lovely house was waiting to be collected to embark on a new journey in its 100 year history, I scraped away on the front - primarily to try and get rid of as much of the brown undercoat splodges as I could. With my blunt and very old craft knife (perfect for this sort of thing) I set to work on scraping....it became obsessive! The brown undercoat came away relatively easily, along with some of that grey gloss paint. So I tested scraping a little of the grey paint from one of the upstairs windows......and it appeared to be that gorgeous terracotta paint underneath. Very excitedly I proceeded to continue scraping around all the upstairs windows...and the result was very satisfying indeed. I then tackled the downstairs windows and found simply the original yellow underneath. So this is it folks...........what a difference! 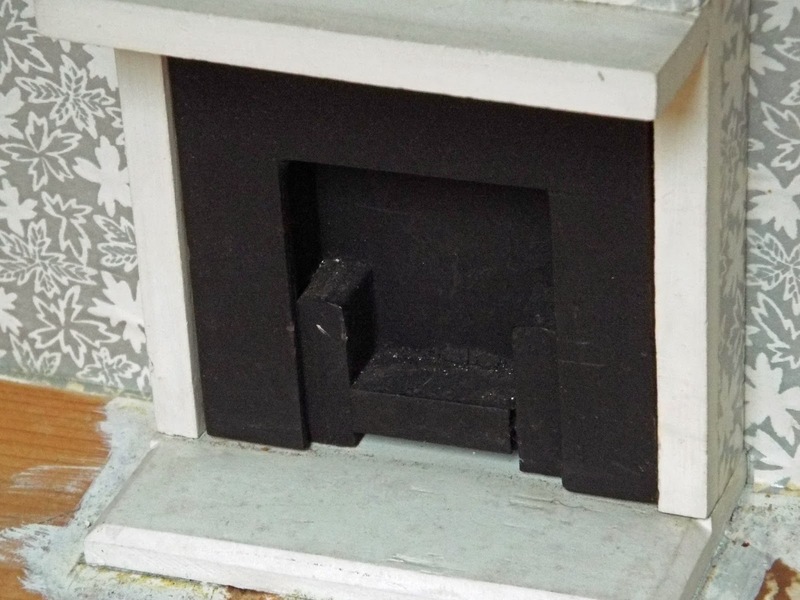 Although you cannot really see in the photo, one can just make out the trace of black scored lines on the lower half.....just like the images in the 1912 advert of some of various different models of Swan Houses. 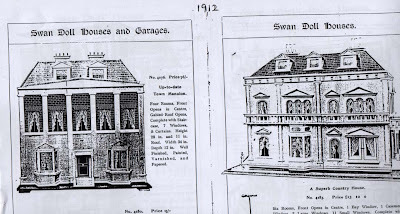 1912 Advert of just some of the other Swan Dolls Houses, these ones are with a flat roof unlike those seen in the previous post that had roofs. Courtesy of Marion Osborne from her A-Z Book of 1914-1941 Dolls Houses. 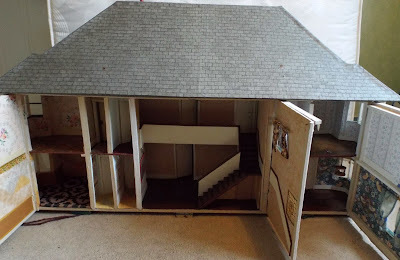 When my customer came to collect the house yesterday, she was both surprised and thrilled at the result. 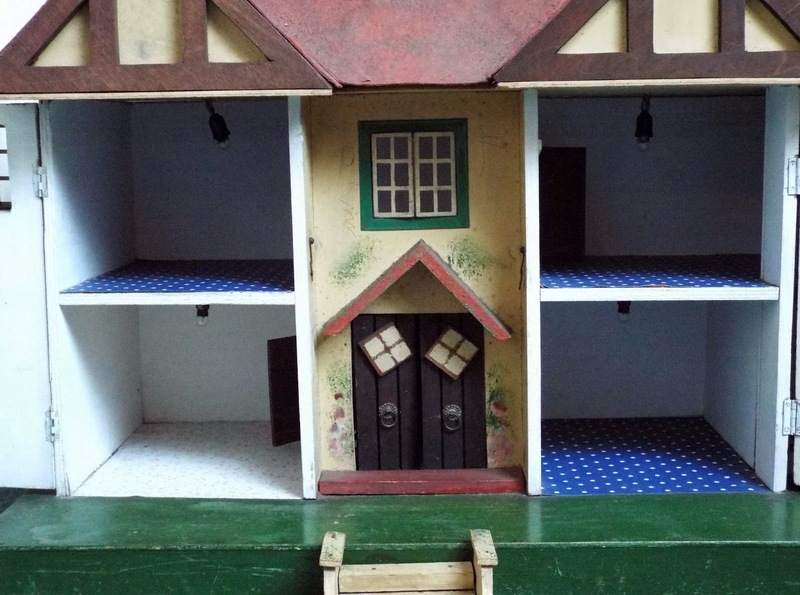 Occasionally I get rather attached to a dolls house, particularly one that I have worked on....and it was an odd feeling having to bid farewell to this lovely thing yesterday but it is most definitely in safe hands. My customer is planning to restore this further, including removing the wallpaper. We are both curious to see what is underneath although initial thoughts are that the original wallpaper has all gone, as we have peeked under side edges where we could and it appears to be bare wood. Oh well...we shall have to see. Hope you have enjoyed looking at this lovely rare dolls house. 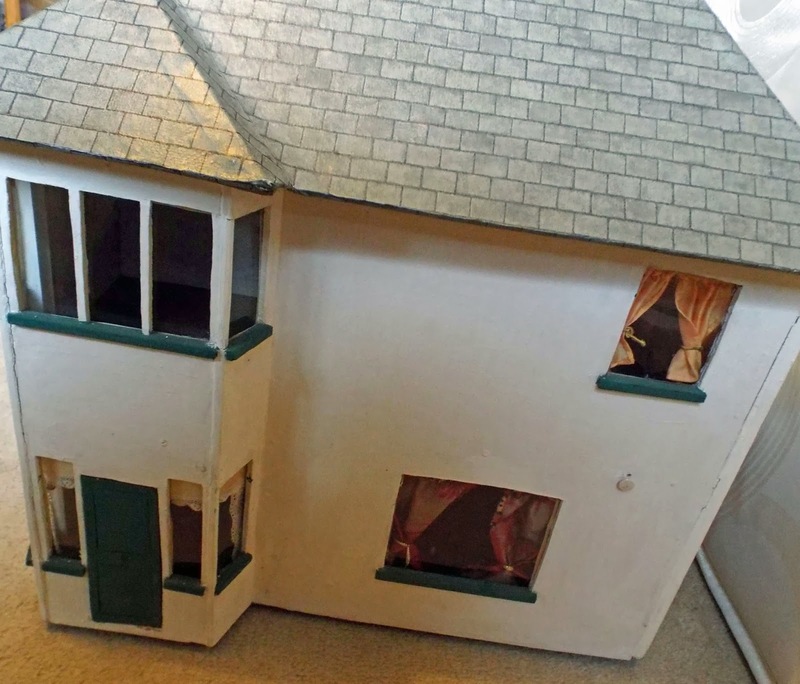 This is a gem of a dolls house, at least 100 years old. 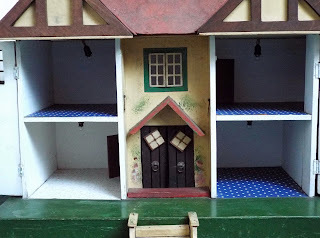 At first I thought it might be German but after much searching through all my usual antique dolls house literature and the internet, I simply could not identify it. 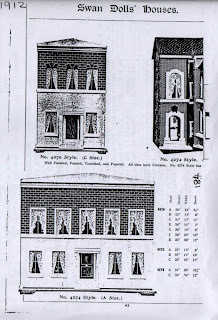 Then by chance I was flicking through my well thumbed copy of Marion Osborne's A-Z 1914 - 1941 Dolls Houses yet again, when on page 185, a black and white scanned image of a circa 1912 Swan Toys advert caught my eye. 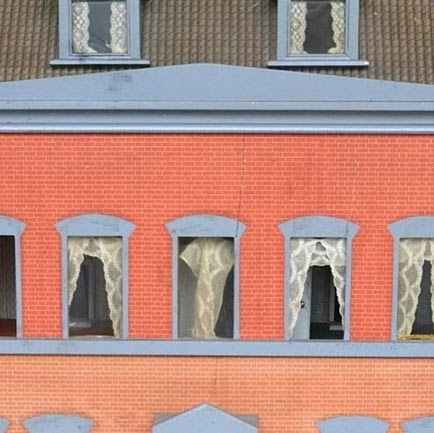 It was the similarity of the roof for the "Up-To-Date Town Mansion" that grabbed my attention. 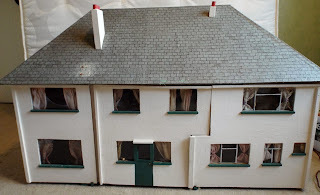 The hand painted tiled roof, the shape of the dormer windows, the way the roof lifts up and the way the very large chimneys are set behind are all identical, so much so that there has to be a connection. 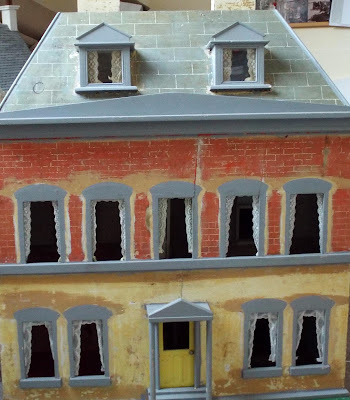 Plus the angled embellishment on the top of the frontage and the hand painted brick top half are similar. I am convinced that this was made by the same company. 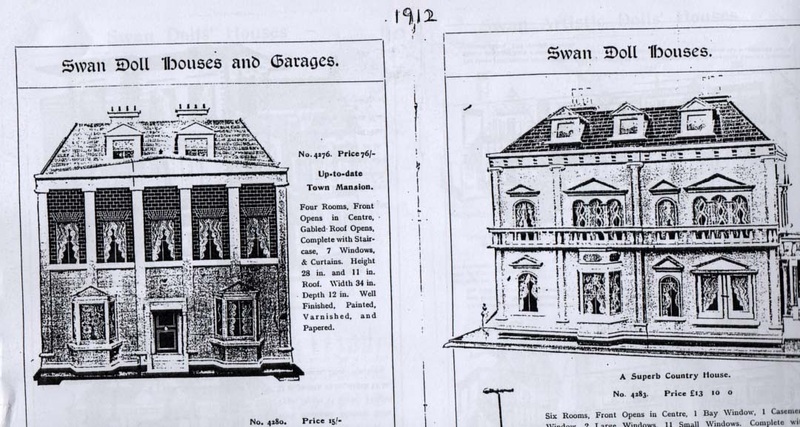 Swan Toys was the trade mark of Star Manufacturing Co which was based in London and which was made up of a group of companies...including Simpson Fawcett & Co. 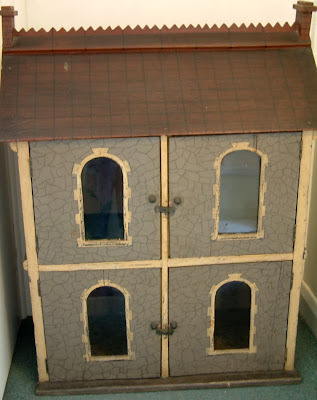 This was what this house looked like when I first took it on. It had belonged to someone's daughter who had been given it as a youngster by her grandmother, but she had no interest in it and was now surplus to requirements. 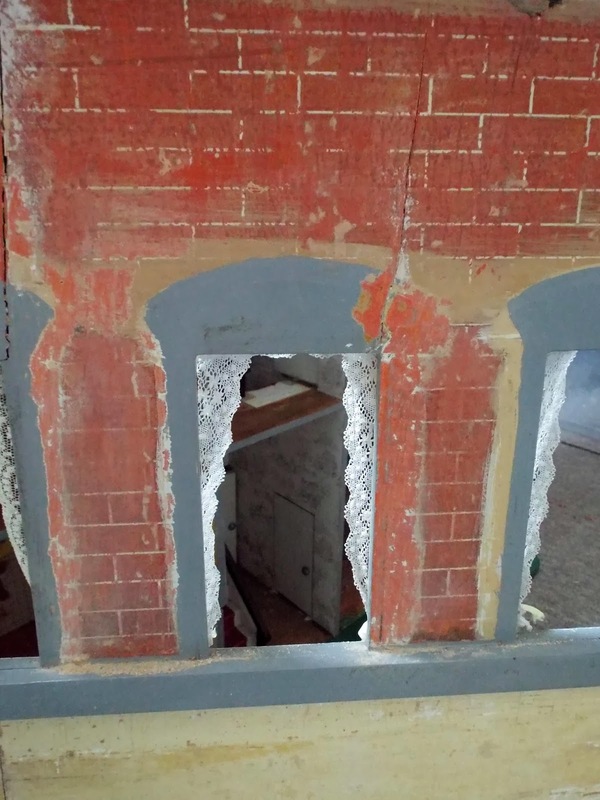 As you can see from the above photo, this was covered in modern brick and tile paper (although the upper tiled paper appeared older than the lower), inside the floors were covered in vintage sticky back plastic which hid an endless number of wires that all led up to the roof. Needless to say, the wiring looked lethal and was the first thing to come out. In the kitchen there was a 1960s/70s Blue Box plastic kitchen unit which was also promptly removed. On the roof, I peeled a little of the tiled paper off at the front and found the hint of some wonderful hand painted tiles....so off it all came very quickly! What I found was truly delightful! 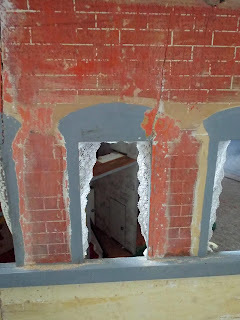 By now I could not wait to see what else was under all the brick paper and this was what I found. 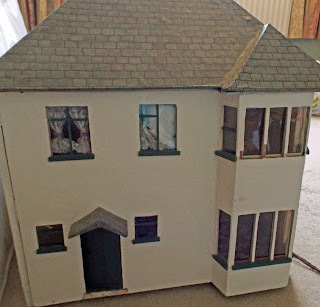 Those of you who like immaculately manicured dolls houses will not be keen on this...but those of you, who like me, adore old dolls houses that are not afraid to show their "wrinkles", you will love this. 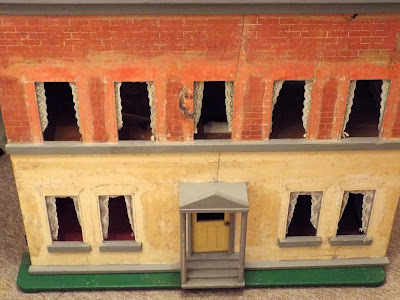 The most glorious hand painted bricks were painted over a rich terracotta colour on the top half. On the bottom half, were the remains of a pretty yellow colour. 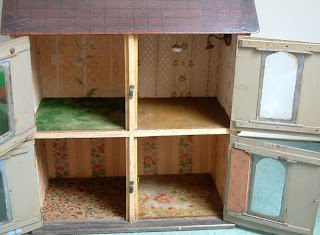 The previous "Grandma" had in good faith, painted around the windows and exterior embellishments in a grey gloss paint. I have to say that I don't dislike it...but of course, whoever took this on, could continue in its restoration and see what is lurking underneath the grey, if they wished. 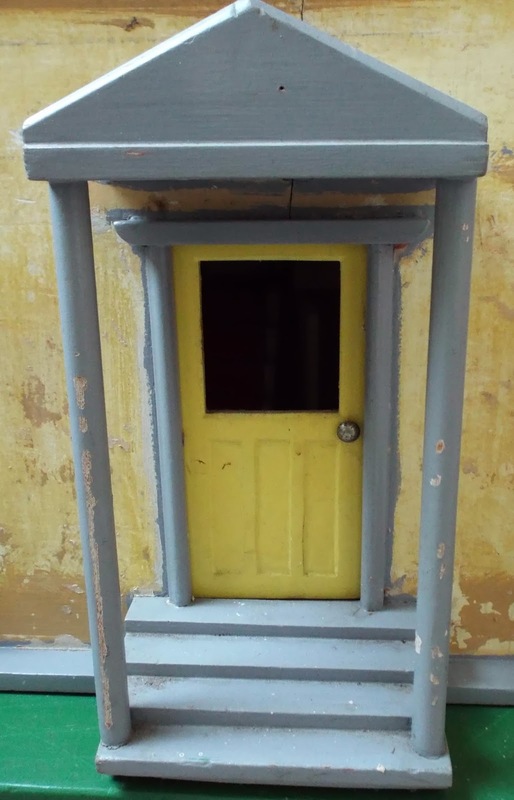 The front door opens...whether the yellow paint is the original, am not sure but there is this rather nice set of steps and canopy. The roof lifts up....you can see one or two cracks along the back of the roof.....a common sight with these very old dolls but is not detrimental to this house overall. Above, you can see a close up of the hall and landing. Generally....this house has been beautifully decorated internally. 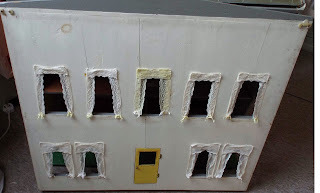 I think "the Grandma" has used gift wrapping paper to cover the internal walls and is definitely in keeping with the house. 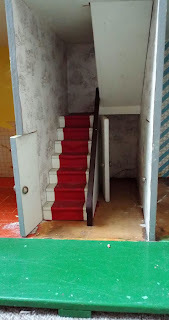 The kitchen has a gorgeous hand painted tiled floor over terracotta paint and must be original to the house. There is a tear in the tiled kitchen wallpaper where the plastic kitchen unit had once been stuck. 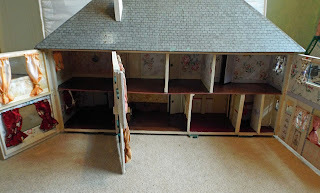 The frontage comes off and can stand freely in front. 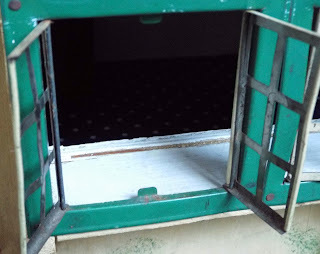 The plastic catch situated at the top of the front has long been broken. I suspect at one time, there were hook and eye catches at each side to keep the frontage in place. This stands at 40" high and is magnificent. The very high ceilings gives the owner a huge scope for furnishing. Personally I would forget about scale and simply fill with old treasures that takes one's fancy. 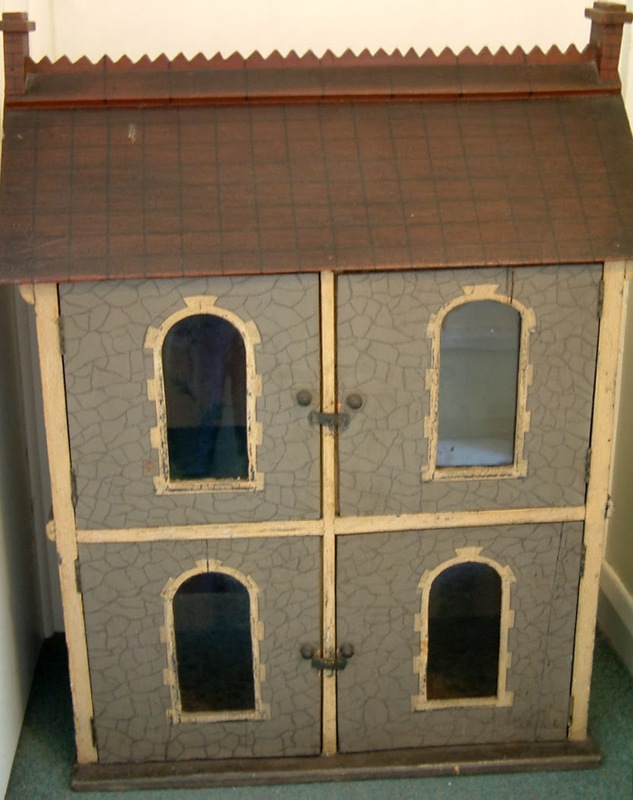 Needless to say.......if anyone out there can shed more light on this dolls house, would love to hear from you! 1930s Dolly Mixture Dolls House Just Gone Up For Sale! 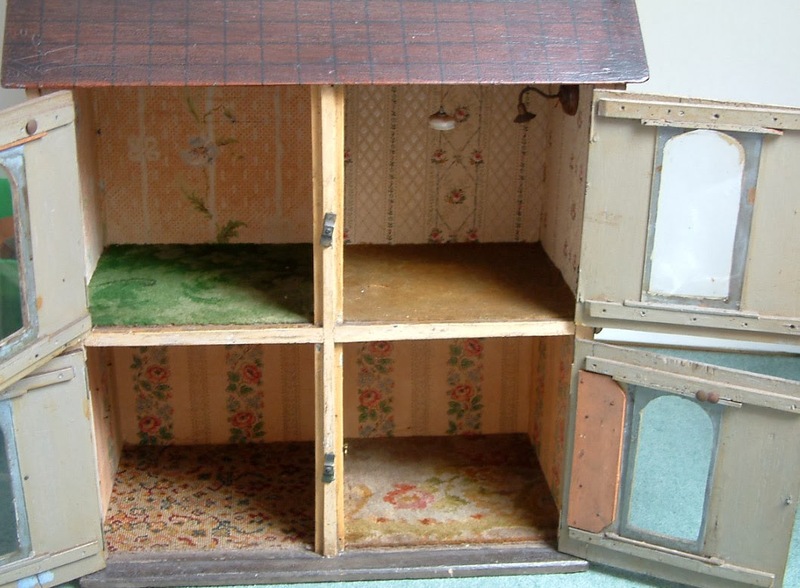 This very pretty dolls house, circa 1930s Dolly Mixture Dolls house, has just gone up for sale. 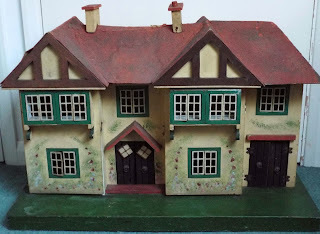 The "Dolly Mixture" name was given to a group of dolls houses, manufactured from the 1930s right through to the 1950s, possibly 1960s. All bear similarities. 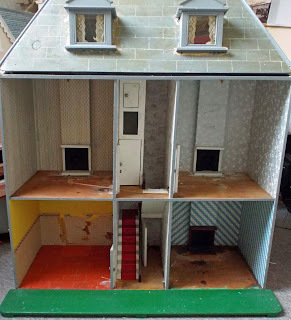 The name "Dolly Mixture" was used by Marion Osborne in her A-Z of Dolls Houses book many years ago...and the name has stuck ever since. 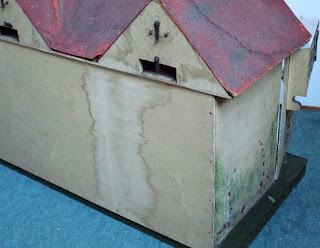 There is stencilled foilage up the frontage and two sides which is very attractive indeed. 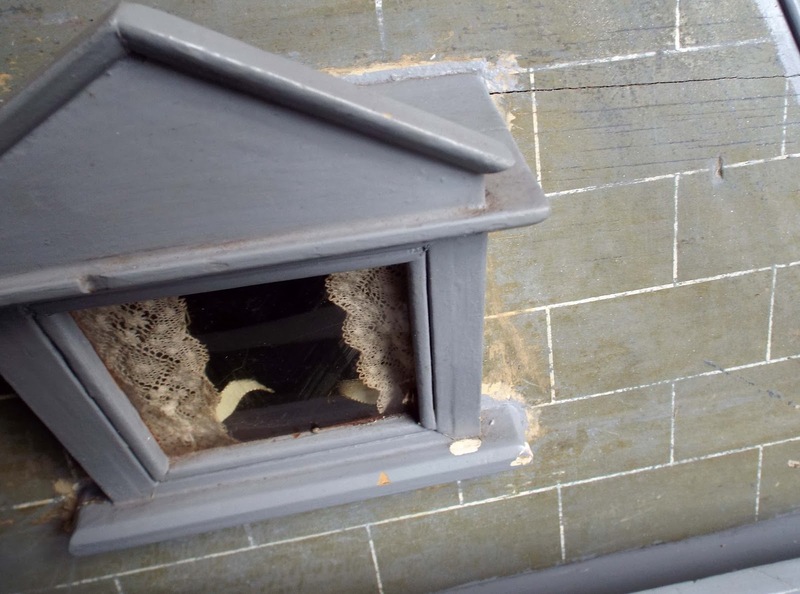 Also the pre-war 1930s early Romside tin windows with rods down each side and no butterfly handles (later versions had butterfly handles and tab hinges) are all present and correct which is refreshing. This version has four rooms, a central staircase and garage.Although the exterior is completely original, the interior has been re-decorated. So whoever takes this on can have great fun decorating inside. 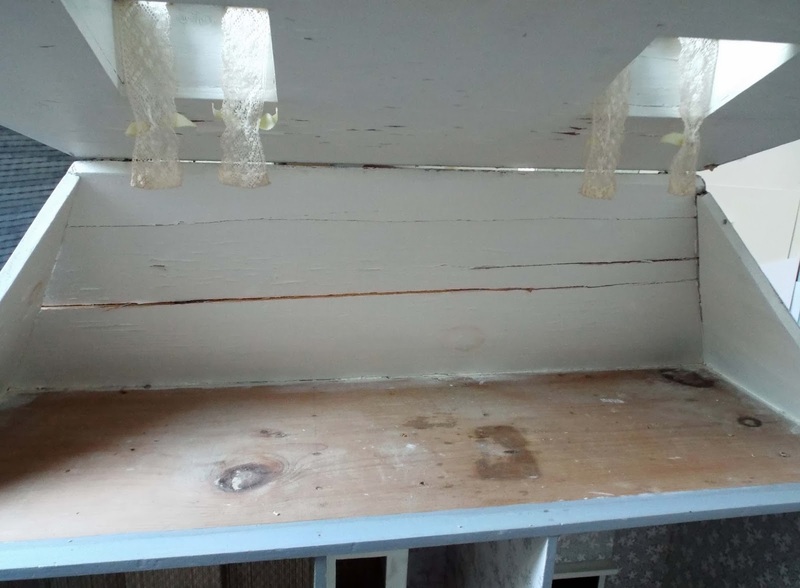 There are signs of water damage on the back exterior and back roof but nothing too detrimental and is all hidden from view. Large Vintage Dolls House "Greenacres" Just Listed To Bargain Basement!! 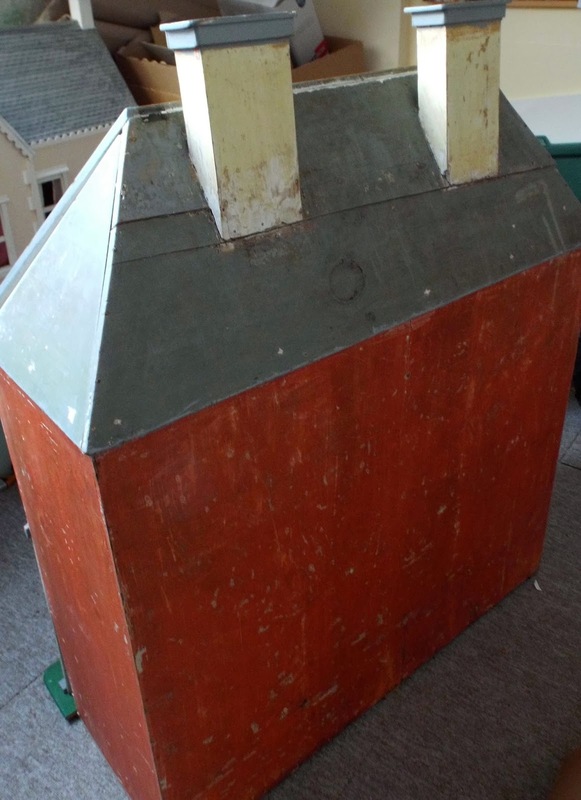 This is truly a bargain for someone and would make a fantastic project...let your imagination run wild. Could be made into a hotel, a boarding house, a school, nursing home....in fact, anything you like. 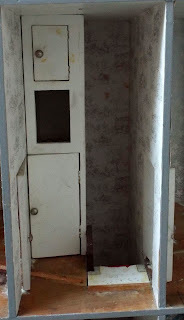 There are simply lots of rooms, nooks and crannies!! 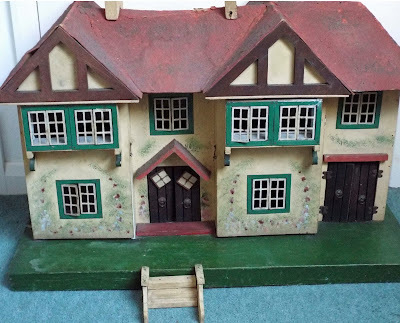 This was called "Greenacres" by previous owner and it had belonged to her mother. No knowledge of origin is unknown but I surmise that it was scratch built in the 1970s or 1980s and probably made originally as a toy. 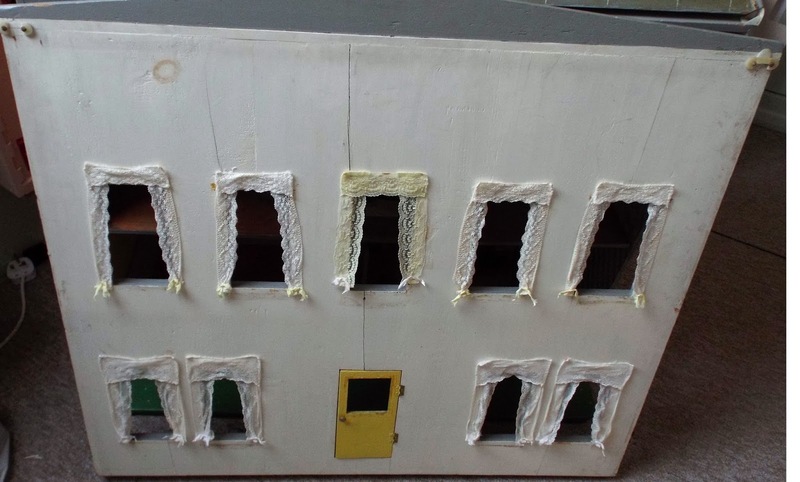 It opens on both sides and there are windows on all four sides of the house. 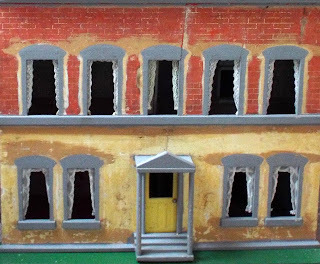 The left side....there is another doorway although some of the doors in this house are mock and do not open. 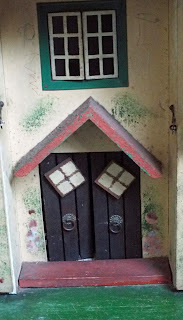 This is the right side...another door. This is the other side of the house and more rooms galore! This house has absolutely HUGE potential and will make a fantastic project for someone. Scale is a bit all over the place and previous owner filled it with a mixture of vintage 1/16th and 1/12th furniture. Due to its size, it must be collected in person from me here in Thame, Oxfordshire....just off the M40. This is a lot of dolls house for not much money!!! 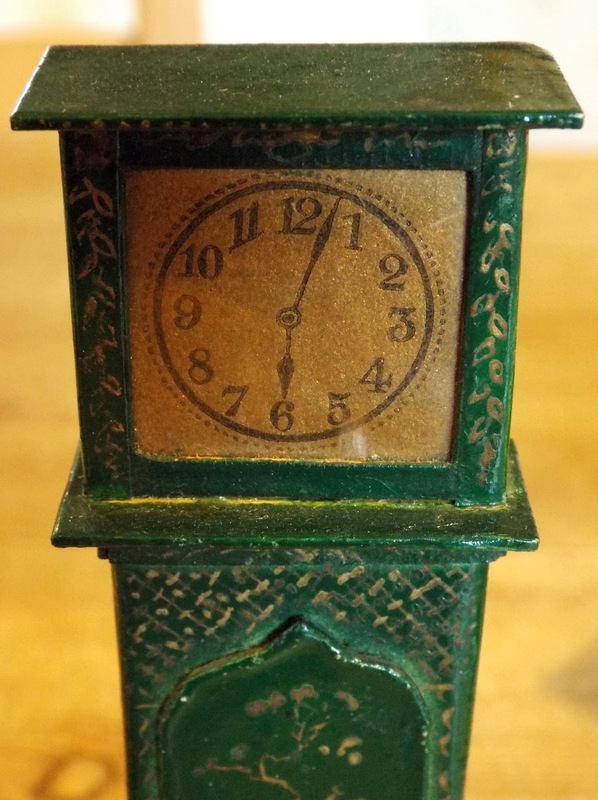 Rare Westacre Grandfather Clock & Pit-a-Pat Phone! 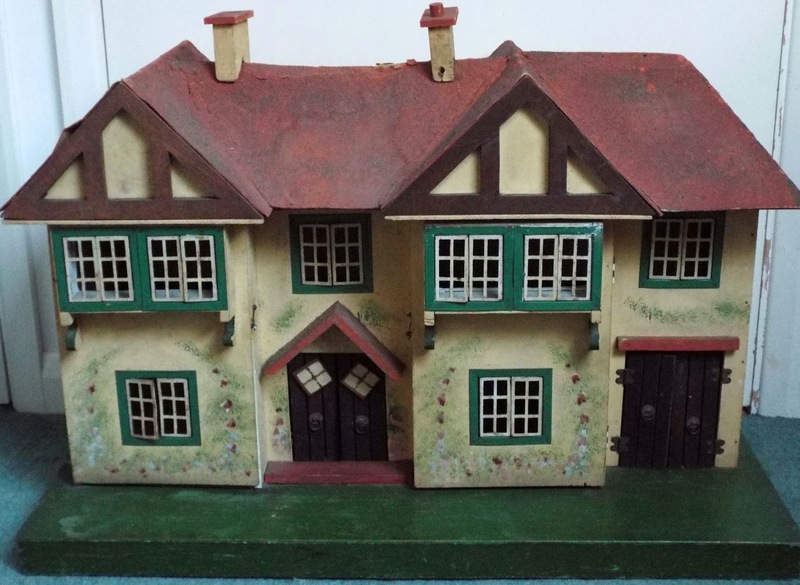 Both these rare items were sold within a few minutes of going up for sale on KT Miniatures website but I am not surprised as they simply do not come along very often. In the whole of my 17 years of trading, it is the first time I have ever handled these two pieces, which indicates quite how rare these are! 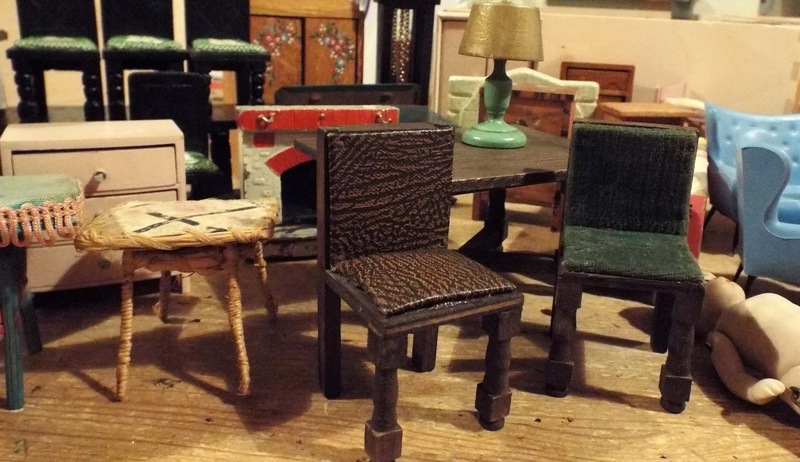 Westacre furniture was made between the two world wars in the Norfolk village of Westacre, by Westacre Village Industry, an initiative spearheaded by Ysabel Birkbeck. Ysabel lived at Westacre High House, Castleacre in Kings Lynn. Local people including children were involved in constructing many of the pieces. The delicate gold decoration found on many of the Westacre pieces, was undertaken by Ysabel or Minnie Cross (the headmistress of the local school) and her sister and sometimes the vicar's wife! 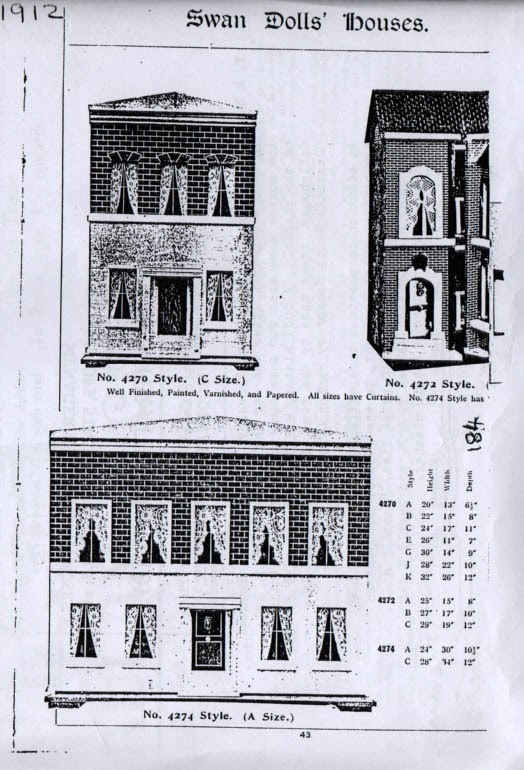 The pieces were sold in the prestigious Morrell's Toy Shop in the infamous Burlington Arcade and would have been expensive. You can see here that time is set at just a few minutes past six on a gold coloured clock face. 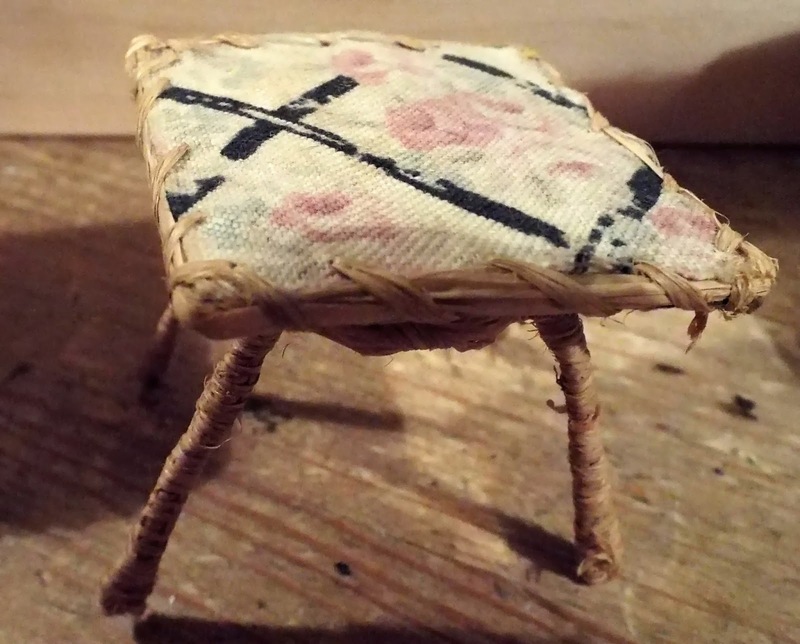 The pieces of Westacre furniture would be made out of many readily available materials such as card, paper, string, wire, beads, paint etc. This clock appears to have been constructed out of card. 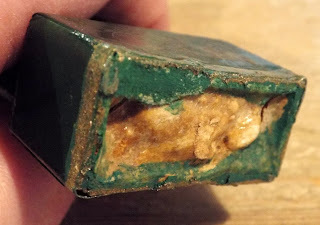 As this was the first time I had actually handled one of these clocks, I was fascinated to see the method of creating a weight in the base in order to keep the clock standing upright...it appears to be a cluster of stones glued in the bottom....ingenious!!! 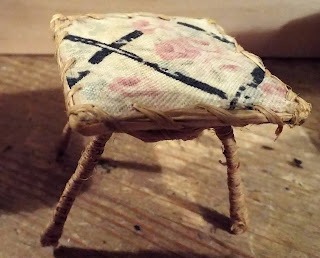 Pit-a-Pat furniture is highly sought after anyway...as the pieces are becoming increasingly more difficult to get hold of. 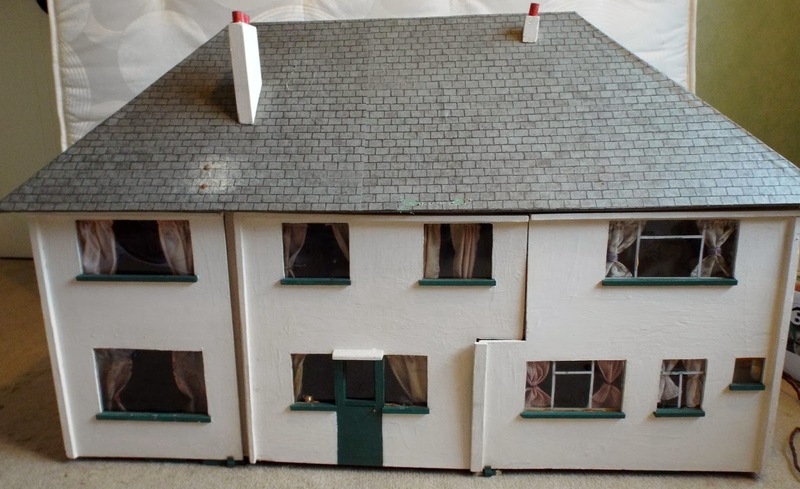 However there are certain pieces of Pit-a-Pat dolls house items that are as rare as hen's teeth and simply do not come along very often. 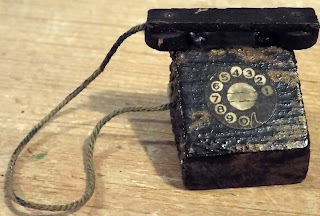 This phone is one of them. 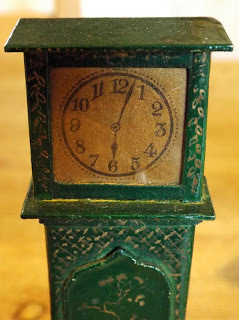 It is made out of wood, with a paper dial and separate receiver, also made from wood. 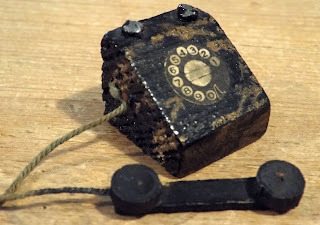 The receiver is attached to the main body by green thread. The phone is painted black with mottled gold. Although these were sold immediately they went up for sale, I thought I would highlight these on here for you all to see. Over the past 24 hours quite a large variety of vintage items have been put up for sale on KT Miniatures website. 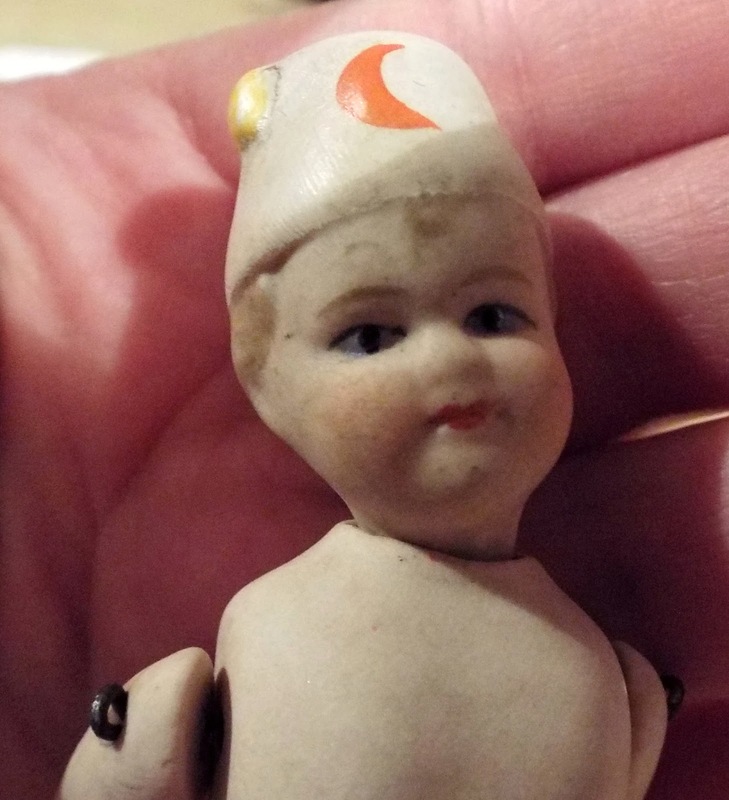 Have you ever seen a doll like this before with a moulded hat that has a crescent on? I certainly haven't! 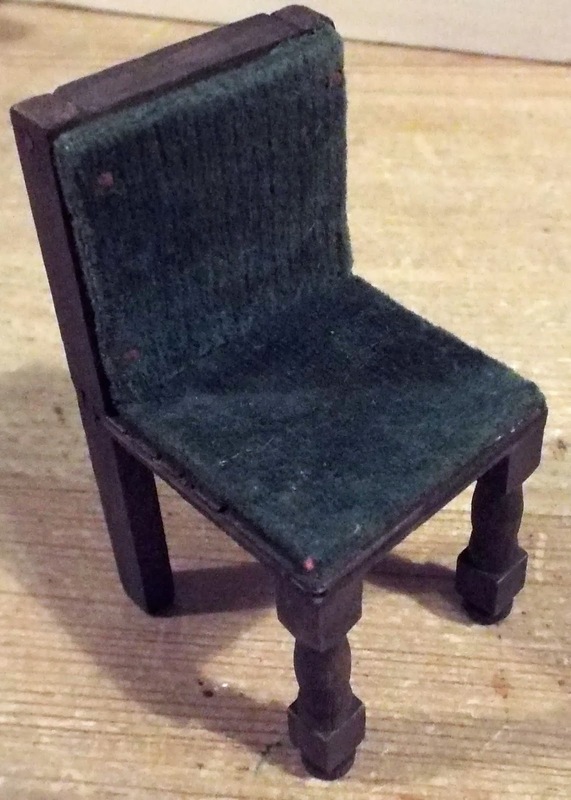 The previous owner told me that it was French....it certainly appears to be a little different from the usual bisque 1930s German dolls that I commonly have here at KT Miniatures. 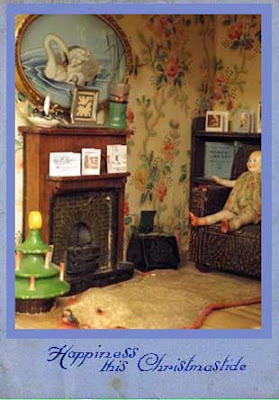 Personally, I think there is something rather charming about this particular doll. 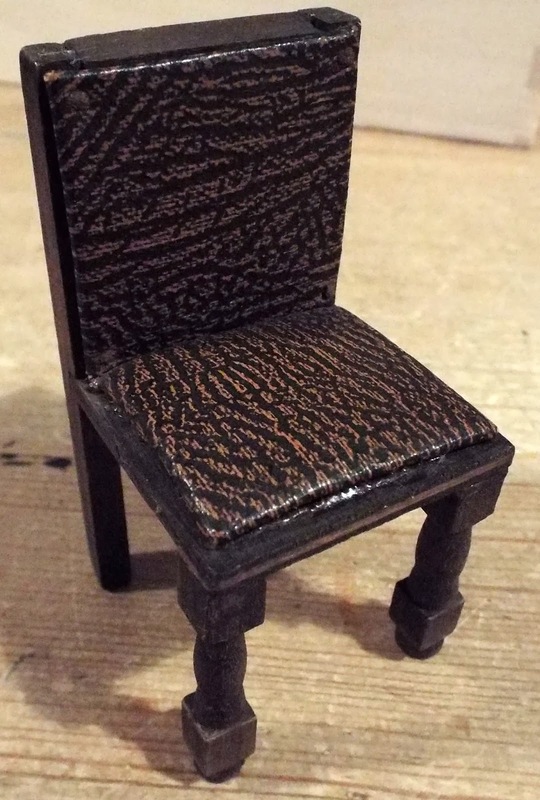 There is no mould number or any kind of makers mark that are often seen on the bisque dolls. Needless to say, if anyone out there can identify it's origin or the significance of the hat, I would love to hear from you. 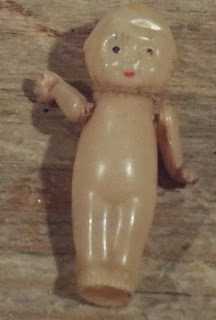 I don't think I have ever handled such a tiny genuine antique Kewpie doll before! 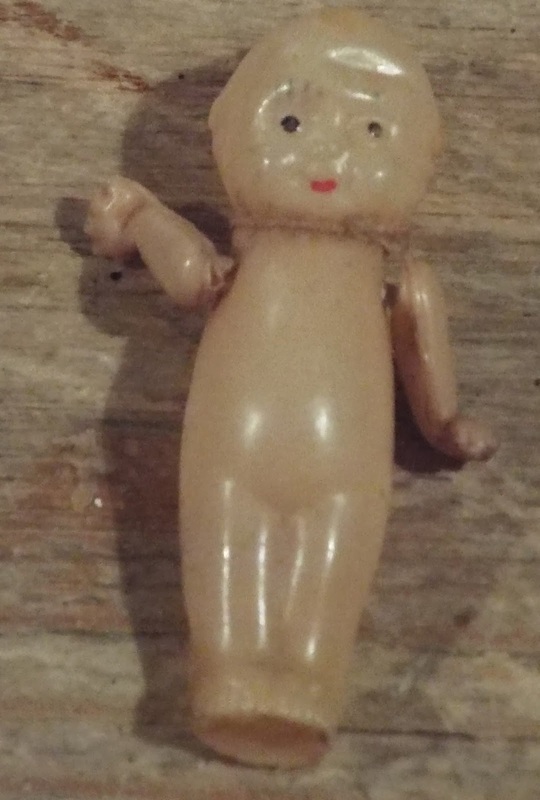 The previous owner (same lady who owned the bisque doll above) tells me that it is a 1930s celluloid Kewpie doll. Its arms actually move and it is only 1 1/2" long. 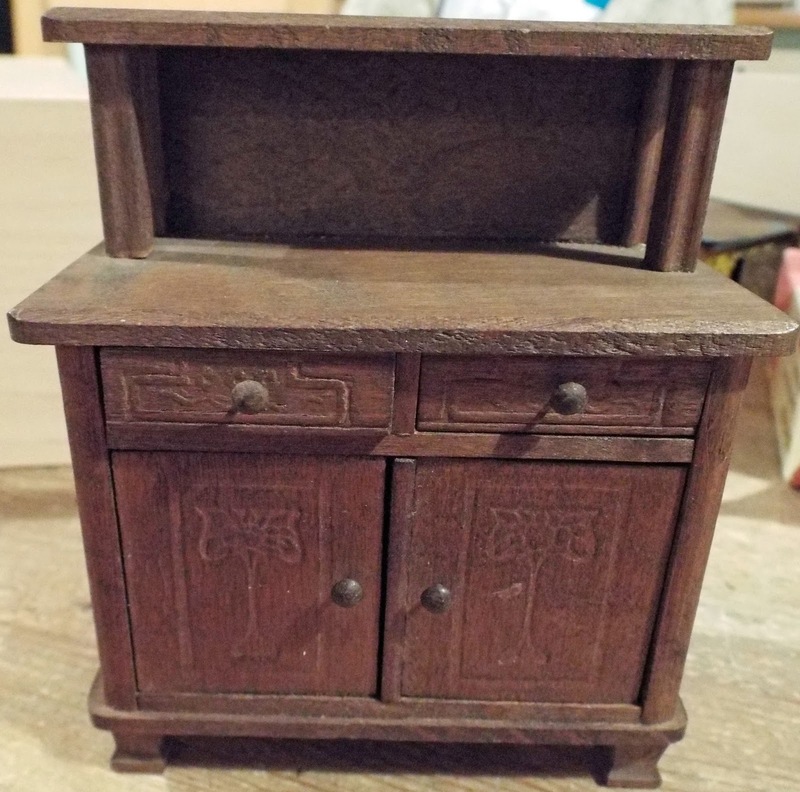 The photo doesn't do this justice...it is actually very sweet and would look fantastic in an antique dolls house nursery. 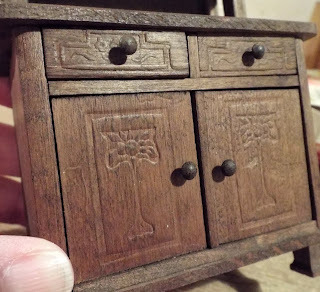 Here is an early 1900s German sideboard. Believed to be oak with beautiful pressed Art Nouveau designs on the doors, drawers and underneath the upper shelf. Isn't it gorgeous!? 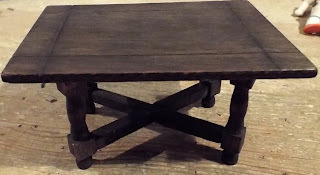 This is a 1930s table with original material table top and embellished with raffia.....I love it! 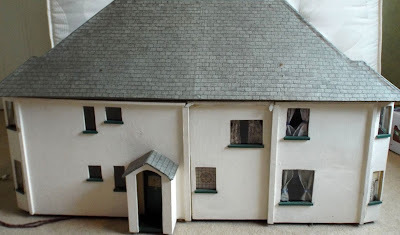 I will be continuing to list to various sections of KT Miniatures' website over the next couple of days plus I have at least two dolls houses to list.